Services at First English Lutheran Church: Returning to FELC, the Samplarians assisted with both the 8:30 and the 10:00 worship services. Each service is wildly different from the other. The early service invited them to take part in a low-key, contemporary-style worship while the second immersed them in a traditional, out-of-the-hymnal service. At each, the Samplarians presented some of the songs and dances they learned at VBS with help from a few of the kids who came to help out. Even when the CD began to skip, they kept on dancing and singing! African Children’s Choir: One of the counselor’s churches hosted this choir, led by a TLS music student, while Sampler was in session. A few Samplarians jumped at the opportunity to hear these children sing, and were left in awe by the talent and confidence of these young artists. Furniture Bank: Putting on their grubby clothes and ready for anything, the Samplarians volunteered at the Furniture Bank of Central Ohio, a place that provides basic furniture essentials to those in need. Much of the furniture is donated, but some of it is built and assembled right there in the workshop. Some of the Samplarians donned smocks and painted legs for tables that needed to be constructed. Others took on the task of putting a desk together, one of those desks with a million pieces and almost-helpful directions. After three hours, they almost had the whole thing together! Class with Dr. Wally Taylor: Dr. Taylor introduced the Samplarians to the life and work of Apostle Paul. They learned about the “sent-ness” of being an apostle (and of being a Christian) and what that means for their own callings. Studying 1 Corinthians revealed insights into Paul’s theology and ideas about Christian life together. Creek Work with Pastor Kurt Keljo: As coordinator of the Blacklick Creek watershed, Pastor Kurt introduced the Samplarians to the many organisms that live in the Creek. He showed them how human waste and run-off damage the Creek, and talked about the fusion of faith and a love for the environment in his own life. In addition, the Reynoldsburg City Council approved a measure that would make the senior center parking lot safer for the residents while also protecting the Creek. Hooray! 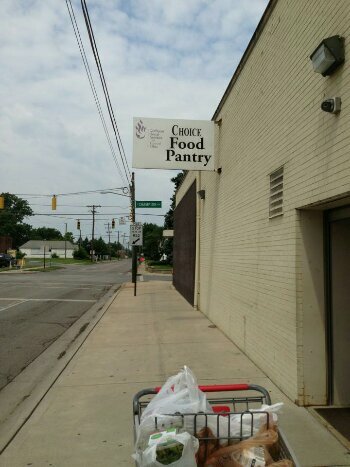 LSS Choice Food Pantry: The Samplarians experienced what it is like to work in central Ohio’s number one food pantry. They learned the Choice system, which allows those in need to pick out which foods they wanted and needed, just like going to an “actual” grocery store. They helped bag food, fill carts, and load cars for those who struggle with hunger every day. Worship Leadership: This week, the Samplarians led the seminary’s Eucharist service. They “burned the midnight oil” composing their ideas into a sermon, and the Presided/Preacher was so impressed, he had nothing to add! The liturgical choir put together a contemporary service and lent their powerful voices to worship, filling Gloria Dei with a joyful noise. Tour of Capital University: With an ELCA university across the street from the seminary, it was a given that the Samplarians would receive a tour of Capital University (also the alma mater of this writer). The tour, led by two Cap students, highlighted many of Capital’s strengths, such as its central location, small class sizes, close student/faculty relationships, Lutheran heritage, and strong academics. The Samplarians also heard a little more about the relationship between Cap and TLS, which continues to grow. Mid-Ohio Food Bank: Having served in a food pantry, the Samplarians went to one of the “sources” of the food that goes out to the community. The Mid-Ohio Food Bank is the distribution center for all of the food pantries in the area. Every day, trucks from the different agencies arrive, pick up their “order”, and bring food to their destinations. The food bank is a huge operation that requires a lot of volunteers to survive. The Samplarians helped pack 301 boxes of food for senior citizens and sorted a ton of bread products for distribution. Gospel Slam: This was the highlight of the week! 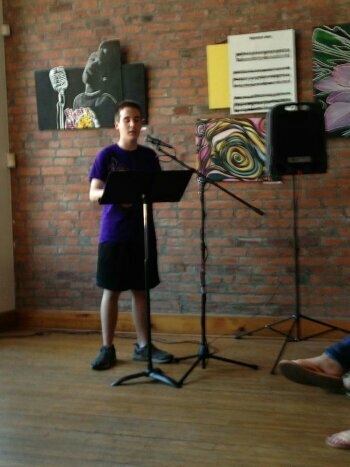 In association with the Academy of Preachers, an ecumenical organization promoting and encouraging young preachers, Summer Seminary Sampler held its second annual Gospel Slam at the Upper Cup Coffee Company. Each Sampler and counselor wrote an original piece based on one of 52 questions found in the Bible (“Where is your brother?” “Whom shall I fear?” “Who do you say that I am?” etc.) and performed it. There were haikus, dramatic readings, poems, and even a few songs! Trinity’s Gospel Slam has become a model for other Gospel Slams around the country. Ronald McDonald House: The Samplarians’ second week of service ended with a visit to the Ronald McDonald House. RMH provides the families of children in hospitals amenities and support so they are able to stay with their sick family member. Knowing a family that has stayed at a RMH, I was glad to serve there. The Samplarians provided lunch for the families staying there, grilling hamburgers and walnut burgers (putting out a few raging grease fires along the way), mixing salads, and scooping ice cream topped by Farmers Market fresh berries. International Dinner: The Samplarians have eaten many different types of food, but they managed to find an Indian restaurant at which to feast. They invited TLS interim president Dr. Tom Ludwig to the dinner and enjoyed the opportunity to get to know him (and he, them). Temple Israel: Christianity is a religion that grew out of Judaism, but few Christians know much about that heritage. The Samplarians visited Temple Israel, a Reformed synagogue and attended a sabbath service. The rabbi was kind enough to give explanations of what was happening in the service and had the Torah paraded around in procession so that they could see it. After the service, the rabbi brought out a Torah scroll and let the Samplarians get up close and personal (without touching it of course). None of us had every been to a synagogue before, so the chance to get personal attention from the rabbi was a blessing. 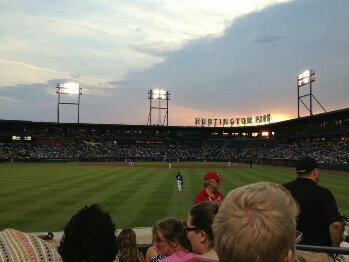 Columbus Clippers: The week ended with the local great American past-time, a trip to Huntington Park for a Columbus Clippers game! Thankfully, the heat broke as the clouds moved in, creating a mild evening. Samplarians enjoyed a dinner at bd’s Mongolian Grill, a walk around Huntington Park, cotton candy, Dippin’ Dots, and, best of all, a Clippers victory! The night came to a close with a fireworks show under a brilliant full moon. Posted on 25 June 2013 26 June 2013 by Pastor KenPosted in Seminary LifeTagged Academy of Preachers, Christianity, discernment, ELCA, Evangelical Lutheran Church in America, Gospel Slam, Lutheran, service, summer seminary sampler, Trinity Lutheran Seminary, youth ministry.